The North Pole is a destination without a marker. Unlike its southern equivalent, which is located deep within the frozen continent of Antarctica and delineated with an actual pole and a nearby scientific base, the North Pole is in the middle of a constantly shifting mosaic of ice atop the Arctic Ocean. There are no mountains, no permanent topographical features of any kind, just a jumbled, jagged icescape. Historically, to be at the North Pole has been to feel as removed from the rest of humanity as it is possible to feel, isolated in a harsh environment, thousands of miles from civilization and warmth. 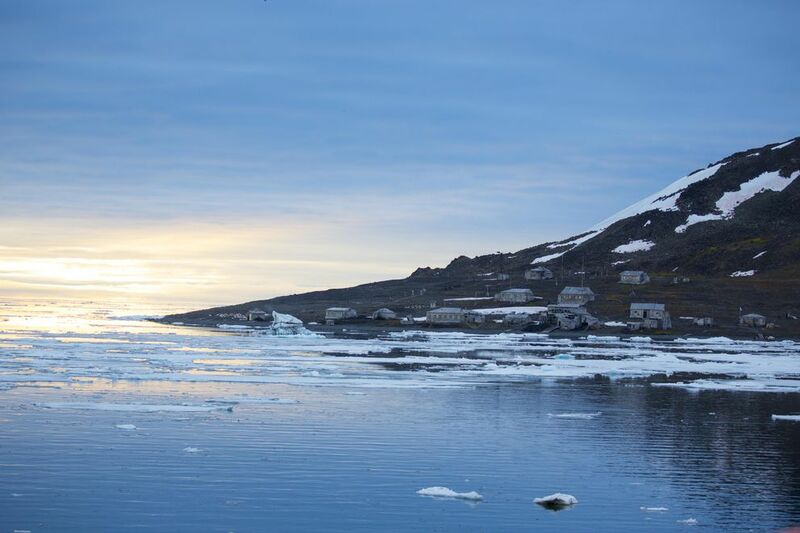 It is a place that as recently as 1846 was described by Sir John Barrow, an English statesman who midwifed the Victorian age of Arctic exploration, as "the only thing in the world about which we know nothing." Long after its true nature has been unveiled, it has continued to bedevil and torment many who have dared to impinge on it. For decades, men and women have striven to reach the top of the world; they have struggled on skis, hauled sleds and endured a litany of miseries - including death - in pursuit of that goal. But when I went to the North Pole, all I had to do was board a flight to Helsinki and catch a charter to Murmansk, Russia, where I boarded a ship. From there, all that was required of me was to kick back and enjoy the scenery, the wildlife and the three multicourse meals per day. 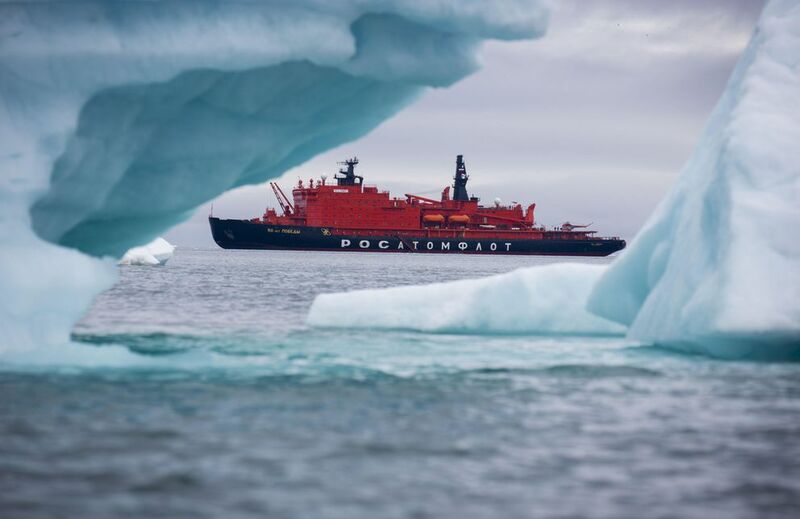 After we reached the Pole, that ship, a 500-foot, 28,000-ton, red-and-black nuclear-powered Russian icebreaker called 50 Let Pobedy - or, in English, 50 Years of Victory - towered over us, about 130 fee-paying passengers from around the world, accompanied by a small handful of scientists and journalists, as we stood in a large circle, each of us wearing expedition-issued bright yellow parkas. 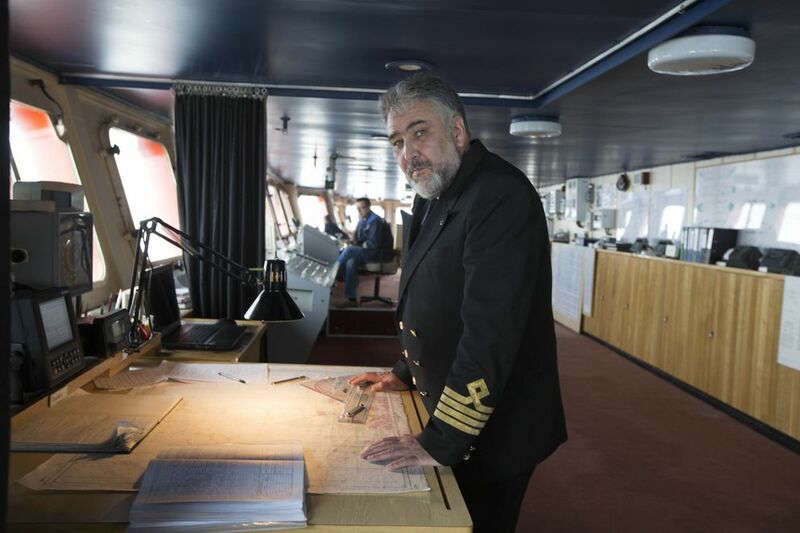 The ship's captain, Dmitriy Lobusov - tall, gray-bearded and looking every inch a Russian sea captain - spoke into a microphone, his words translated by an aide by his side. "Congratulations to you all on achieving your dream," he said. And if none of us could lay claim to any achievement even remotely on the scale of those who had danced with death as they battled to be where we now stood, just the very fact that we were now here, that we were standing at the top of the world, placed us in rarefied company. Less rarefied, however, than it used to be. In 1977, another nuclear-powered icebreaker, the Arktika, became the first surface vessel to reach the Pole. The journey has been completed multiple times by several vessels in the four decades since; our voyage was the 123rd. The top of the world has become a tourist destination: an extraordinarily expensive one, certainly, and one reached only infrequently. It is nonetheless achievable with far greater ease than anyone might reasonably have imagined even 50 years ago, when the number of expeditions that had traversed the sea ice and stood at the Pole could be counted on the fingers of one hand with a digit or two to spare. Its accessibility is not the only way in which the Pole and its environs differ from half a century ago - a difference that was evident during our journey. 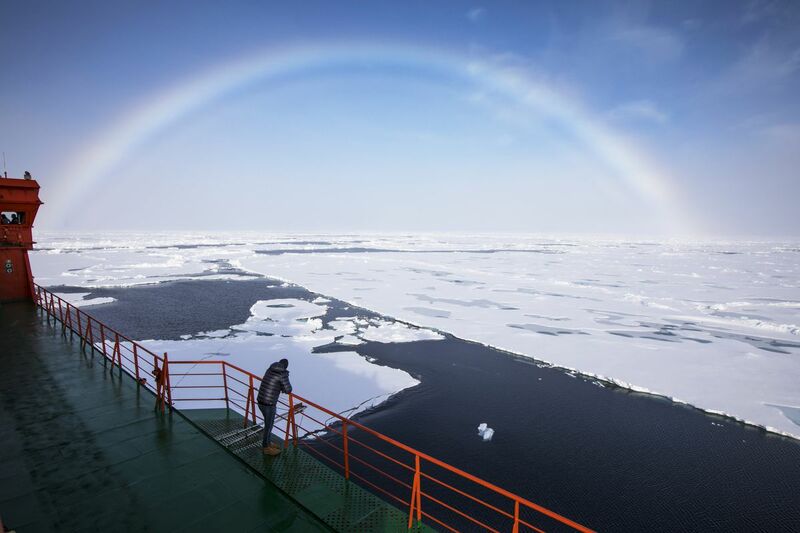 "I have been working in the area for 30 years and been doing North Pole voyages for 24 years, and I've seen many changes in the ice conditions," Captain Lobusov said during the voyage north. "As we approach the North Pole, you can see we have many stretches of open water." To travel to the North Pole is to be acutely aware of not only the isolation of the present, but also the weight of the past, of those who sought to be where we now stood, to meet, in the words of Sir Arthur Conan Doyle, the "challenge of human daring." It is also, increasingly, to consider the future - to wonder whether, just as the window of accessibility is cracking open, the opportunity to see the North Pole as we know and imagine it is already starting to close. If, as Robert Peary claimed, he, Matthew Henson and a team of Inuit were the first men to stand at the North Pole on April 6, 1909, they did so after more than a month of hard slogging from Canada’s Ellesmere Island. Sixty years later, when Wally Herbert became the first person universally acknowledged to have walked to the Pole, he and his team had been on the ice for fully a year, having been forced to make camp over the long Arctic winter and wait until currents carried the sea ice in a favorable direction. In 2017, those of us on board 50 Let Pobedy made the trip in less than five days. We arrived in Murmansk, the second- largest port in northwestern Russia, on an August afternoon and began our smooth, steady journey northward that evening. We had been instructed not to take any photographs until we were clear of the port, which is home to the Russian nuclear fleet; but as the ship slipped from its moorings, as the mood lightened and as the celebratory on-deck toasts loosened inhibitions, that admonition was soon forgotten. Cameras and cellphones clicked away as Victory eased quietly out of harbor, into Kola Bay and northward into the Barents Sea. Within two days, we had reached Franz Josef Land, an archipelago of 192 islands that is the most northerly land in Eurasia - at its northernmost point, a mere 560 miles from the Pole. We would visit it again on the way south, but in between, once the archipelago had slipped over the horizon astern of us, we would see no land. The journey to the Pole was devoid of craggy cliffs and stunning vistas, the only variants the extent and thickness of the ice floes that surrounded us, the amount of water that separated them and the wildlife that crossed our path or tailed in our wake. Our first sightings of ice came as we made our way past the archipelago, but it was in the evening that we left the islands behind us that the sea ice shifted from being an occasional interloper to the dominant feature of our surroundings. The ship rattled and shuddered as it entered the Arctic Ocean ice pack, crushing and plowing through the floes. Smaller ones were tossed casually to one side, but even the larger sheets offered little to no resistance. "The experience of hearing and watching the ship break ice is as mesmerizing as watching fire," advised Solan Jensen, a hyper-efficient Alaskan with a Zen mien who functioned as assistant expedition leader for Quark Expeditions, the adventure travel company that had chartered the vessel. As if to prove him right, I leaned over the bow for hours on end and watched as a crack would appear in the ice then race ahead in jagged fashion, splitting a floe asunder then widening and ultimately separating the floe into two or more pieces as Victory waltzed arrogantly through. Victory makes only five trips to the North Pole with paying passengers each year, chartered alternately by Quark and Poseidon Adventures; it spends the bulk of its life breaking through the ice of the Northern Sea Route, which connects the Barents Sea to the Bering Sea across the top of Russia, opening pathways at the head of convoys of cargo and container ships. It is a working ship, not a cruise liner, and the accommodations - notwithstanding the journey’s starting price tag of $27,000 for the 11-day round trip - reflect as much. Still, if the cabins were not ornate, they were functional - the one I shared with friend and fellow Arctic obsessive Geoff York had a pair of bunks, a desk, a small bathroom with shower and plenty of storage space - and replete with nice touches, including daily housekeeping service topped with a nightly treat of 50 Let Pobedy-branded chocolate. The bunks were plenty comfortable, too, so much so that neither Geoff nor I was in any hurry to rouse ourselves from them in response to a 6 a.m. call over the ship's PA system that a polar bear was on the ice nearby. We had both seen plenty of polar bears - Geoff is a polar bear biologist and senior director of conservation for Polar Bears International; I have had a lifetime of writing about the environment and wrote a book about polar bears in 2011 - and by the time I hauled on my layers of cold-weather clothing, this one would surely be disappearing into the distance. It took a series of increasingly insistent calls, like an alarm clock that refused to be held back by the snooze button, before I hauled myself out of my slumber and onto the deck, Geoff in close pursuit. We peered over the ship's bow at the scene unfolding in front of us. The initial male bear had been joined by a second, picking his way among the ice floes, sniffing the air and investigating the unfamiliar aromas that were gently wafting their way toward him. If either bear was in any way concerned by the presence of the nuclear-powered icebreaker, neither registered any visible displeasure. The initial bear, rotund and healthy, spent most of his time doing what polar bears often do: lying at the edge of a floe, conserving his energy and perhaps hoping a seal might pop out of the open water. The second headed closer, but then, as if belatedly becoming aware of the presence of the first, displayed caution and kept his distance. We watched them for a while until those on board had had their fill, and then the ship ghosted slowly and silently away. My first Arctic voyage 20 years previously had been on a 950-metric-ton, ice-strengthened converted sealing ship; the vessel coped admirably with all but the very thickest of ice floes, but its captain dealt with them cautiously, slowing down on approach, avoiding them whenever possible, pushing them out of the way when he could and riding on top of them and breaking them when necessary. On board Victory, Captain Lobusov had no such cares; even as the dinner plates and wineglasses rattled, the ship plowed through the ice as if it were wet tissue paper. Initially, our wonderment was at Victory's immense strength, a product of twin nuclear reactors driving engines that generate an almost-unfathomable 75,000 horsepower. The passage through open water on our first couple of days out of Murmansk had been effortless. But our expectation was that such effortlessness would ultimately be somewhat tempered the farther north we traveled and the thicker and more extensive the ice became; instead, onward Victory barreled, barely breaking a metaphorical sweat. The ship's log underlined just how little opposition the ice offered: In open water, its daily average speed was between 18 and 18.5 knots, and although it naturally slowed as its path grew increasingly frozen, on the day of our approach to the North Pole, it was still clocking an impressive 13 knots as the would-be resistance yielded meekly before it. "It really drives home how quickly the ice responds to even slight changes in temperature," said Colin Souness, a Scottish glaciologist who works on board as a Quark guide, scientist, lecturer, boat driver and human Swiss army knife. "At one degree below freezing, ice is resilient and quite rigid. But as soon as it gets to zero [Celsius], it becomes so much softer, and you can see that with the ease with which the ship is just gliding through it." Once sea ice became the dominant feature of the seascape, it remained so until we were well south of the Pole on the journey home. There was substantially more sea ice on the surface of the Arctic Ocean than there was open water. There was sea ice in every direction, and lots of it. But there should have been: We were, after all, closing in on the North Pole. What was notable was the seeming absence of meaningful progression in the extent and, especially, thickness of that sea ice as we journeyed north. Even in August, at the height of summer, as Arctic sea ice cover is racing toward its minimum extent for the year, the outer reaches surrounding the Pole should have been guarded by old, thick floes, those that had survived melt season after melt season, piling on top of one another and growing over the years, wizened icy sentinels forming a barrier to further easy progress. But wherever we looked, and however far north we steamed, such old ice just was not there; even when at their most extensive, the pans through which we barreled were largely flat and new. Captain Lobusov supported our suspicions: "Now, we hardly see the thick, multiyear ice we used to have two decades ago," he acknowledged. As ice thins, it becomes easier to melt. It is a vicious cycle: A warming climate causes old sea ice to shrink and thin during the summer, to be replaced by thinner sea ice that is more vulnerable to further melting, and so on. Which is why, although sea ice extent numbers grab the headlines each year, there is at least as much scientific concern over declining sea ice volume. And the statistics supported our anecdotal observations: According to the Polar Science Center at the University of Washington, 2017 had the lowest annually averaged sea ice volume on record. 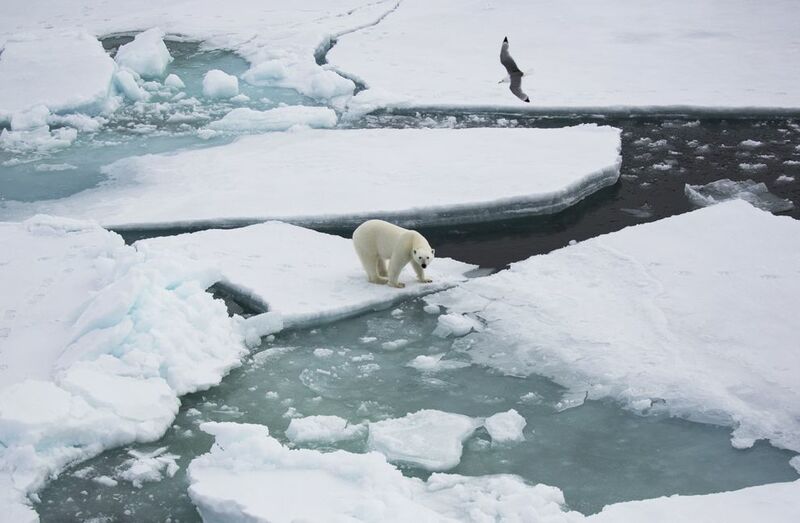 (In total, sea ice thickness in the central Arctic Ocean has declined by more than 65 percent since 1975.) Not that we knew that at the time, of course: We just kept looking out at the ice, allowing ourselves to grow briefly excited by hints of it becoming thicker, and to wonder whether, just over the horizon, we would start to see gnarled, jumbled masses of ice that had grown over year upon year. We watched, and we waited, and we searched, but they never came. Ranjan Sharma, a well-traveled allergist from North Carolina, had flown to the South Pole in January and now, with his partner, Stacy Lawson, was adding its northern equivalent. Proud alums of the University of North Carolina at Chapel Hill, they had brought their alma mater's championship flag to unfurl at our destination. But, he said, "I just hope there's enough ice for us to stand on at the Pole." We would find out soon enough. By the evening of Day 5, the goal was in our grasp, and with just a couple of hours to go, Solan, in the wheelhouse, began counting down the remaining time and distance over the ship's PA system like a NASA controller. Slowly but surely, a crowd swelled on the bow, where Quark staff stood ready with glasses of champagne and shots of vodka. At a little after midnight, we came to a halt, to several long, loud blasts of the ship's whistle and an eruption of cheers from the 130 or so passengers assembled on deck. "I'll be honest," said Palle Weber, a passenger from Southern California, expressing a disconnect I shared at reaching such a formidable location in such pampered fashion, "it feels a little like we just summited Everest by helicopter." But the ease of our journey did not diminish the significance of the destination. The passengers partied into the night; as they did so, the ship got underway again. If anything, the ice seemed even thinner and more scattered at the Pole than at any point since Franz Josef Land, and Captain Lobusov was forced to spend several hours overnight steaming around in search of an area that was suitable for him to park the ship. Once he had done so, and while the rest of us slept, the Quark team set up the site to be as safe as possible for passengers to disembark. Flags marked a trail deemed sufficiently secure, across thick enough ice and away from treacherous water. For the more daring sorts, an open patch of water next to the ship provided an opportunity to leap - while securely tethered - into the freezing Arctic Ocean and emerge as swiftly as possible. Once we descended on the ice, most of us took short walks. A few played soccer. At lunchtime, we sat at picnic tables and had a barbecue. Ranjan and Stacy posed for photos with their UNC flag. And then, Ranjan said, "I had to break away for a bit. I needed some time alone, to reflect on where we were and what it meant and all the things that had had to happen in my life for me to be here." A hundred yards or so from the ship, a replica British phone booth marked the spot at which Quark staffers stood with a satellite phone, so every one of us could call a loved one - briefly - from the North Pole. My loved one lived in Anchorage, almost exactly 12 hours behind ship time; my call woke her from a deep slumber from which, notwithstanding her determined effort to express her enthusiasm, she never fully emerged. I think it seemed to her like something of a dream; neither of us had expected to be able to talk to each other at any point while I was gone, least of all from the Pole itself. I handed back the phone and wandered off for a moment of solitary contemplation. A sharp wind, uninterrupted by any geology, drove across miles of sea ice. We had been parked at - or, more accurately given the ice conditions, as close as possible to - the Pole for 12 hours or so; we would remain for only a few hours more until we began the journey south. Most of the passengers now retreated to the comfort of Victory or were preparing to; only the hardiest were still on the ice playing soccer. Soon all signs of our presence would be gone: the barbecue tables, the soccer goal, the phone booth and then even 50 Years of Victory itself, disappearing over the horizon. In two weeks it would return, for the last time in the season, and then it would be gone again, taking with it the last signs of life at this most remote of locations. Summer would be over, the temperature would plummet, and the North Pole would surrender anew to the cold and the dark. On the first day of our journey south, we encountered an iceberg, looming out of the gloom in the distance. As we approached, the sun punched its way through the haze, shining a spotlight on the cathedral of ice that lay before us and illuminating it in all its glory. It was immense, an ice island with mountains and valleys. It had almost certainly traveled hundreds of miles, breaking off from an ice shelf in Greenland and drifting slowly east, gathering sea ice around its base as it did so, until it stood before us, a vast, solitary sentinel of ice seemingly visiting us from an Arctic era long gone. It was undoubtedly ancient, an emissary millennia in the making, and its size suggested it should exist for millennia more. But once it had broken free, it was doomed, vulnerable to the wind and the waves, slowly shrinking day by day until, in a matter of years, it would be gone.